We'll have six weeks of mid-week #MACtion and #FunBelt games this year, with 13 Tuesday and Wednesday games in all. A little over 20 years ago, Conference-USA—led by then-commissioner Mike Slive (yes, the Mike Slive of SEC fame)—brought mid-week mid-major football to the national stage. ESPN was an enthusiastic partner, and our football-watching has never been the same since. Fans get to see football on non-traditional nights. Moreover, these nights have produced some incredible mid-week games for those who were football-starved from Sunday to Saturday. The modern excitement, however, is much more recent. We can trace the founding of #MACtion back to a single game—the glorious defense-less battle between Northern Illinois and Toledo in 2011. The game came at a perfect time, too—college football fans were just getting into the swing of using Twitter as the social media platform was in the process of exploding. Chunk play after chunk play (and it was good offense, not just bad defense) kept fans excited and coming back for more. Seven years later, we’re still coming back, hoping that our mid-week football will replicate that. It’s not just the MAC, though. The Sun Belt Conference also signed a contract this decade with ESPN, putting more mid-major mid-week games on the docket. The Sun Belt also has plenty of exciting, high-scoring games, so #FunBelt joined #MACtion for the mid-week football party. Last year, we were incredibly spoiled. Not only did the mid-week games start a week earlier in the season (Week 6, on October 4th), but the overall schedule meant that football fans could see an FBS or NFL game every single day from October 31st through Wednesday, November 22nd, as there were no games the day before Thanksgiving. This year, we kick off #FunBelt action tonight, on October 9th. It’s Week 7, but we are getting a great game out of it. Two of the expected favorites in the Sun Belt will be duking it out. Arkansas State is at home, but the Red Wolves have already lost a game (to Georgia Southern). Appalachian State, meanwhile, has only lost one game—a game it probably should have won against Penn State. The Mountaineers would like to send last year’s Sun Belt champions to an 0-2 start in conference. Interestingly enough, the Sun Belt—with only ten teams—switched to divisions this year. Taking advantage of a rule change made for the Big 12—that a conference no longer needs 12 teams to host a championship game—the Sun Belt split up into divisions. 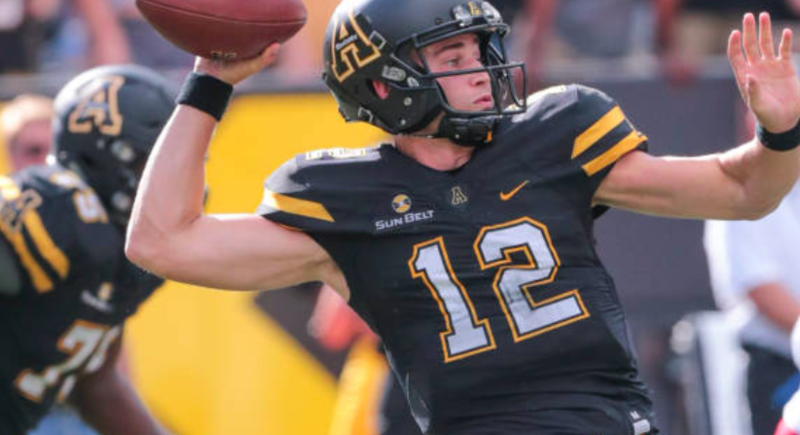 The divisions are highly unbalanced, though, with three of the best teams (Appalachian State, Georgia Southern, and Troy) competing in the East. Arkansas State should be a heavy favorite to win its division even if the Red Wolves lose tonight, but a loss could be damaging for Appalachian State. As I’ve mentioned before, Appalachian State could have a real claim on the Group of 5 New Years’ Six bid. It would take some chaos in the AAC to knock that conference out, but a 12-1 Appalachian State team, whose only loss is in overtime to Penn State, would have a solid claim. The Mountaineers will want to put on a strong performance to impress journalists and committee members, since this is their only Tuesday or Wednesday game of the season. Just because Appalachian State is only playing one mid-week game, though, doesn’t mean that’s all we get this year. Far, far from it. Next week won’t see any games on Tuesday or Wednesday night (Appalachian State does play next Thursday night, though). Week 9 only has one Tuesday night game (Troy at South Alabama). It’s not a strong early October for #FunBelt action, and there are zero mid-week #MACtion games. Don’t worry, though, because November will make us forget all of that. The MAC starts November early, as Tuesday, October 30th sees two #MACtion games, and Ball State visits Toledo the following night. Then, just like last year, there is football every night for almost an entire month. The following two weeks (Week 11 and Week 12) will each see three more #MACtion games on Tuesday and Wednesday. Week 13 has two Tuesday night #MACtion games, but like last season, there will be no games on the day before Thanksgiving (November 21st this year). There are also no more mid-week games after Thanksgiving. That’s the schedule for this year. We will be treated to six weeks with mid-week games, for a total of 13 games. There are only two scheduled #FunBelt games this year, but we do get 11 #MACtion games. All in all, there will be FBS or NFL football on television every night from Thursday, October 25th until Monday, November 26th, with the one exception of November 21st (the night before Thanksgiving). That’s a whole lot of football. As fans, there’s not much more to ask for.